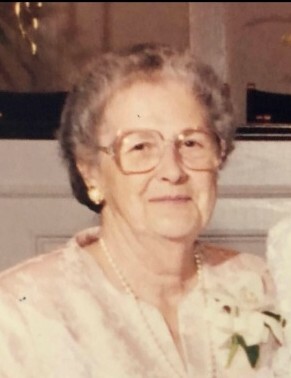 Mrs. Mary Sue Dove Hackle, 94, of Winnsboro passed away on Saturday, July 14, 2018. Born in Winnsboro, she was the daughter of the late Clarence Lee and Julia Odom Dove, Sr.
She is survived by her son, Robert Louis (Em) Hackle, Jr.; two daughters, Marsha Sue Wright (Tommy), and Cathy D. McIlwain; six grandchildren, John Richard (Rennie) Ingle, Mark Brady (Candace) Ingle, Robert Trenton (Tonya) Hackle, Kelleigh H. Barner, Melissa I. Stroud (Charlie), and Lorri W. Wood (Ray); ten great grandchildren and one great-great grandson. In addition to her parents and husband, Robert Louis Hackle, Sr., Mary Sue is predeceased by her daughter, Julia Mae Riggs; and two grandchildren, Andy Riggs and Kit McIlwain. Funeral services by will held at 11:00 AM Thursday, July 19 at Stephen Greene Baptist Church conducted by Reverend Dr. Mickey Cockrell and Reverend Dr Lawrence Dennis. Burial will follow in the church cemetery. The family will receive friends one hour before the service in the church. In lieu of flowers, memorials may be made to Stephen Greene Baptist Church, 500 Seventh Street, Winnsboro, SC 29180. Pope Funeral Home is assisting the Hackle family.